The mayor of one of the best biking cities in the U.S. is not a fan of electric bikes. To de Blasio, e-bikes represent “a real danger,” and his administration has been cracking down on a particular type known as throttle-powered, which allows a bike to move without pedaling. The crackdown unfairly targets a mode of transportation the city’s delivery workers rely upon—while the city’s bike-share system rolled out its own electric pedal-assist bikes and its Department of Transportation launched a pilot program with dockless e-bikes. Now New York’s City Council is hoping to change all this. The city’s legislators recently introduced a bill to legalize all electric bikes, as well as electric scooters, on New York streets. In addition to allowing the pedal-assist bikes offered by bike share companies, New York City would legalize throttle-powered bikes, and e-scooters, like Bird and Lime, which are also throttle-propelled. 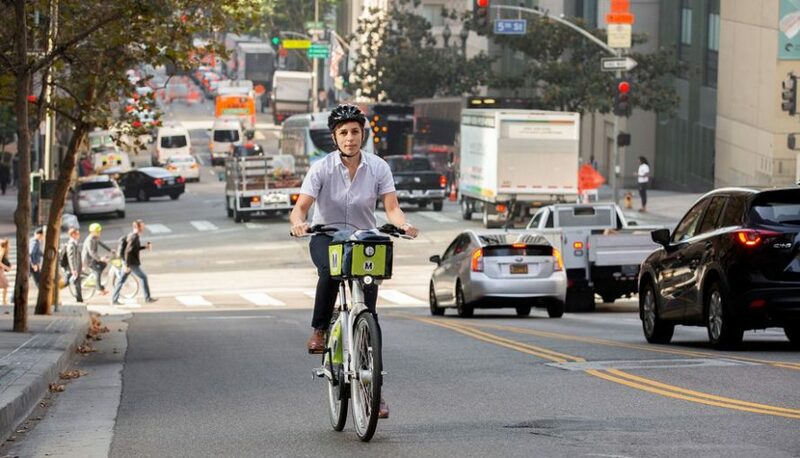 I was thinking about de Blasio’s safety concerns as I rode around Los Angeles on two different electric bike shares that the city offers now. We don’t have a lot of protected bike lanes here in LA, which makes it intimidating to ride alongside cars. We also have some hills, which makes it both intimidating and physically demanding to ride alongside cars. Plus, I always seem to have a heavy bag full of work and mom gear with me that adds extra pounds to my load, and distracts me when I’m trying to focus on not getting killed. But on an electric bike, these things hardly matter. I merge onto streets with confidence because I’m moving as fast as most cars. I zoom up inclines I would have otherwise avoided on a pedal bike, shortening my commute. When a light turns green, I’m fast off the line and don’t have to worry about making it across wide or poorly maintained intersections. I’m freed of the weight of my heavy bag, which fits nicely into a sturdy front basket. On an e-bike, I’ve never felt safer biking on LA’s streets. I’m not too surprised that a 6-foot-5-inch able-bodied man who lugs his belongings around in an SUV doesn’t understand how e-bikes could be transformational for someone like me. But he should pay attention. Because as many other cities have already learned, adding more e-bikes will likely get more people riding. A 2018 study by the National Institute for Transportation and Communities that surveyed 1,800 e-bike riders found that they bike more often, take longer trips, and make different types of trips than they do on pedal bikes. Not only did more respondents feel safer riding an e-bike than they did riding a pedal bike, the percentage of people who felt safer on an e-bike was even greater when the respondents were women, over 55, or had physical limitations. The large majority of adults—50 to 60 percent—are “Interested but Concerned” about biking. They see themselves as potential cyclists, but are too scared to ride. “Riding a bicycle should not require bravery,” said Geller. Yet that’s what an e-bike is—bravery underfoot, delivered as needed. Addressing the nuisance issue is actually the easy part—just give everyone who’s not in cars a set of guidelines and a lot more space. In California, we legalized and categorized e-bikes to help govern where each type of e-bike (and scooter and moped) can go, along with speed limits and helmet laws. The investment will double Citi Bike’s area of coverage and triple the amount of bikes on streets—including adding more of its very popular electric bikes. Citi Bike is already the most successful bike-share system in the country. But even in a fairly flat city with many transportation options and a good cycling culture, there are many parts of New York that have low density, infrequent transit, and no bike lanes. These are places people might resort to using cars, if they don’t feel safe on bikes. E-bikes are not a substitute for safer infrastructure, but they could help move more riders from “Interested but Concerned” to “Enthused and Confident,” which should be the number-one goal for every city. That 60 percent of adults who might decide to ride is who cities should be catering to when welcoming new modes and designing new infrastructure—not the 10 percent of adults who are already out there. And e-bikes can make that decision easier—for women, for older adults, for those with different abilities, for people who have to haul more than a MacBook to work every day. When we say yes to new modes we can’t just say yes to a particular model of e-bike or scooter. We have to say yes to a bigger idea—to help more people feel empowered to get out of a car. Now how could a climate mayor say no to that?